Political corruption in New York isn’t headline news to anyone unless it’s of an exceeding limit. The political corruption that occurred at the Tammany Hall for over 40 years was more than enough to make headline news in New York, especially after the construction of the New York county courthouse. During its construction, a carpenter who worked for two days was paid $360,751 which now has a value of about $4.9 million. It wasn’t a surprise that Thomas Nast who was a famous Republican cartoonist used his skills against the Tammany Hall at Harper’s Weekly magazine. The reign at Tammany Hall was over with the help of Eleanor Roosevelt after her son was defeated in an election which was caused by the Tammany Hall. 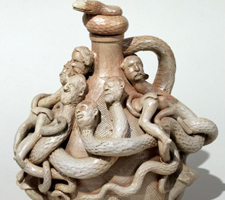 The corruption at Tammany Hall and the efforts of Thomas Nast is detailed on the Snake Jug by Anna Pottery. 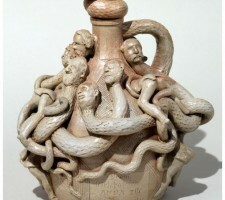 You can call it weird or odd or amusing but I call it legendary and my research object.